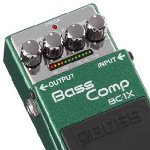 Boss are known worldwide as the company who put �stomp� in �stompbox� and are most recognizable for their legendary array of colourful bass and guitar effects pedals. AC-CS-3 The very best in pedal technology, Boss bring us the CS-3 Compressor Sustain Pedal. AC-TE2 For the fans of echo and ambience effects who may be struggling to find something that sets them apart from the crowd, the Boss TE-2 Tera Echo Guitar Pedal brings a unique approach to delay. 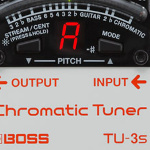 AC-TU3 The Boss TU-3 guitar tuning pedal is perfect for accurate tuning at home and on-stage when visibility is a problem. AC-RC30 Brand new from Boss comes the feature packed RC30; on hand to loop whatever you like - it will even accomodate a microphone! AC-RC1 The all new Boss RC-1 Loop Station offers an extremely easy to use and affordable guitar effects pedal for looping and building riffs. Boss RC-1 Loop Station comes designed for straightforward looping, delivering an experience focused on fun, letting you record, playback, overdub and undo or redo loops. AC-GT1000 Delivering unmatched sound quality and musical expression, the GT-1000 ushers in a new era of performance in amp/effects processors. AC-SD-1W Crafted with an ear for highly refined sound, the Boss SD-1W hot rods the famous BOSS overdrive with all-discrete analogue circuitry. AC-OD-1X Get ready for a huge advancement in guitar pedal technology - the Boss OD-1X Overdrive Pedal offers the most inspiring and ultra-responsive natural driven tone ever! 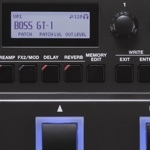 AC-GT100 The next generation Boss GT-100 Multi-Effects processor has arrived. The new BOSS effects flagship boasts next-generation amp modelling that recreates vintage amps as well as providing new COSM tones that cut through on stage. 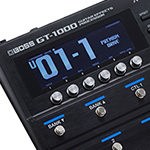 AC-GT001 The GT-001 packs the acclaimed amps and effects of the flagship GT-100 Version 2.0 in a stylish desktop processor for your home studio or mobile rig. 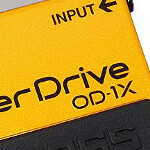 AC-ODB3 For an amazing overdrive bass effect the Boss ODB3 Bass Overdrive effects pedal has to be the winner. 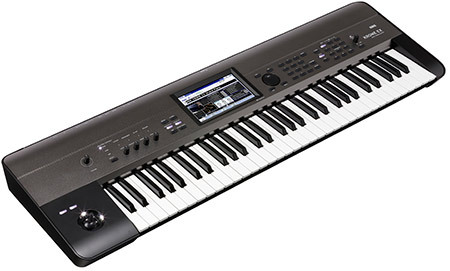 All the latest info and deals at instruments2go. AC-BD2 Boss BD-2 Blues Driver. 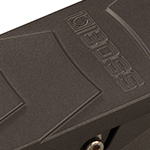 This boss effects pedal delivers the slightly crunchy sound associated with blues guitar. AC-GE7 GE-7 Seven Band Graphic EQ.The Boss GE7 enable to shape your guitar sound and eliminate any feedback with seven band equalization. 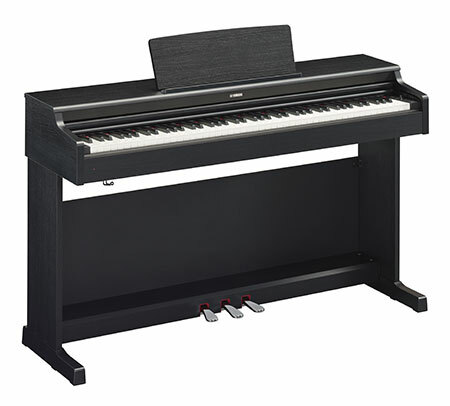 AC-GT-1 Ultra-portable and easy to use, the GT-1 delivers pro-level tones everywhere you play. 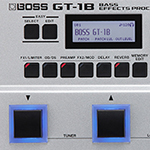 Powered by BOSSs GT engine from the GT-100 this pedal really packs a punch. AC-DS1 The Boss DS1 Distortion is an easy to use, mega-affordable pedal that offers hard edge distortion whilst retaining your sound dynamics. AC-DD3 The Boss DD3 is a metal chassis, rock solid delay pedal offering superior quality, control and reliability all in one single Boss compact pedal. AC-RC505 Powerful tabletop Looper for beatboxers, singers, performers, and instrumentalists with easy hands on controls and 5 individual phrase loopers. AC-BD2W Crafted with an ear for highly refined sound, the BD-2W takes the classic Blues Driver grit to a new level with all-discrete analogue circuitry. 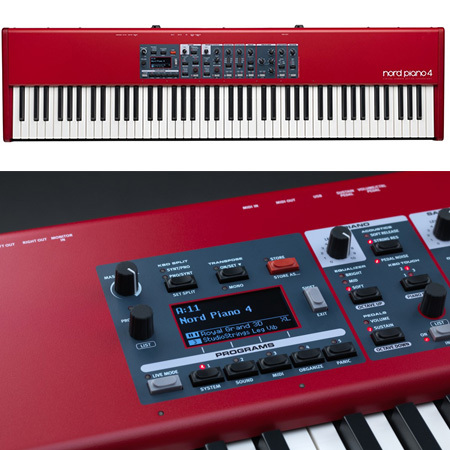 AC-VE5-Red The Boss VE-5 Vocal Processor takes 6 high quality effects from the popular Boss VE20 Vocal Processor and adds a looper feature perfect for beat-boxing. 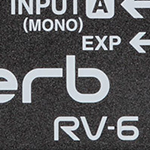 Add a fresh dimension to your vocal productions with the VE5. AC-DS1X The DS-1X Special Edition Premium Guitar Distortion Pedal brings the classic Boss distortion into a modern era of expression. Despite the original silver screw this is more of a re-envisioning than a mere reissue. AC-GT-1B After the success of the GT-1 It has now been redesigned specifically with the bassists in mind! 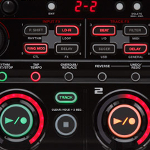 save all your presets and effects into banks and easily switch between them all with your feet. AC-LMB3 The Boss LMB-3 Bass Limiter and Enhancer Pedal smoothes out your playing by eliminating harsh volume peaks, even when using dynamic slap and pop techniques. AC-RC-202 Perfect for club performers, electronic musicians, and beatboxers, the RC-202 packs powerful BOSS looping and multi-effects in an amazingly compact tabletop unit. AC-ES-5 Control all your effects like never before with the ES-5 effects switcher. Save and store custom setups for instant recall when playing live. Now there is no need to start having to press lots of pedals live when one controller control them all. 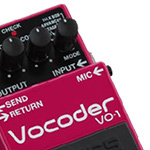 AC-VO-1 Talk or sing with your guitar as the Boss VO-1 vocoder pedal humanises your guitar tone like never before. Create amazing effects and tones to make your sound stand out. Chat with an expert in-store - call today. AC-TU-3S The BOSS TU-3 is the worlds go-to stompbox tuner, trusted by players everywhere for its reliable operation and bulletproof durability. Ask our in-store experts about TU3s today. AC-VE-1 Every vocalist can benefit from having professional-grade reverb and studio effects to sound their best on stage. 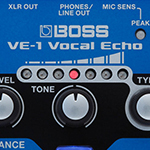 This is what the BOSS VE-1 Vocal Echo is designed for�to make your voice sound even more incredible when you sing. AC-PW-3 The all-analog PW-3 delivers pro wah tones in a rugged, space-saving design that conserves precious real estate on your pedalboard. 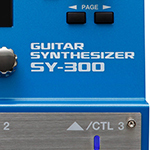 AC-SY-300 Grab your favorite axe and dive into an extraordinary world of sound creation with the SY-300 Guitar Synthesizer. The SY-300 can be used with all your guitars right away, with no special pickup required�just plug into the standard 1/4-inch jack and play! AC-VE-8 For singer/songwriters who play acoustic guitar, its a competitive, crowded world out there. AC-FV50L A low impedance volume pedal for use with keyboards and similar instruments. 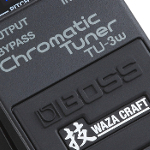 AC-TU-3W With the TU-3W, BOSS brings Waza Craft mojo to the worlds leading stompbox tuner. AC-FS6 Boss FS6 Dual Footswitch. Two foot pedals for use with many Roland and Boss products including Cube-XL amplifiers, SPD-30 and others. 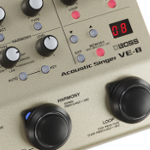 AC-VE5-Wh The Boss VE-5 is the latest in compact vocal processing. With high quality vocal harmony effects and a built-in looper feature for incredible live vocal performances the VE5 is a must have for any vocalist or beat-boxer. AC-PSA240 This regulated 9 Volt Power Supply for Boss products is the only recommended power supply for Boss Compact Pedals...along with a whole bunch of other stuff. AC-DD-7 Create amazing effects with the Boss DD-7,6.4 seconds of delay time and 40 seconds of input recording! AC-BC-1X Intelligent Multiband Compression for Dynamic Players. AC-PH3 The Boss PH-3 Phase Shifter pedal offers a wealth of vintage and contemporary phasing effects, including new "Rise" and "Fall" modes for unique, unidirectional phasing. AC-OS2 The Boss OS2 gives you a choice of overdrive or distortion or lets you combine both - all in a single compact pedal - works for guitar or bass. AC-BF3 BF-3 Flanger, with Tap Tempo and Pan/Gate Modes. Building on the 20-year legacy of the famous BOSS BF-2, the new BF-3 Flanger pedal gives guitarists and bassists an updated version of the classic BOSS flanger with the thickest stereo flanging sounds ever. AC-AW3 Boss AW-3 Auto Wah. A Talking Pedal The AW-3 Dynamic Wah is the first compact wah pedal to incorporate human voice-type sounds through a new "Humanizer" Mode. AC-RC3 Featuring an enormous 3 hours stereo recording internal memory capacity and 99 onboard memories for storing loops, the Boss RC-3 is a dynamic update to the Loop Station range. AC-VE20 The Boss VE-20 is the first Boss pedal aimed at vocalists, capable of pitch correction, harmonies and effects for live and instant use on stage or in the studio. AC-MO2 Using the rich harmonic overtones of your guitar as a starting point, the Boss MO-2 creates unique sounds that enhance and thicken the normal tone, with three diverse sound-shaping modes! AC-CEB3 The CEB-3 Bass Chorus pedal offers a split-frequency chorus effect capable of applying warm, rich chorusing to the higher frequencies without muddying up the lows. 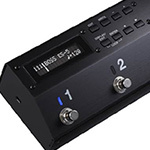 AC-LS2 The Boss LS2 Line Selector pedal represents the easy way to switch settings among several effects devices or amplifiers, or route input and output signals. AC-ML2 The Boss ML2 metal Core effects pedal is perfect for rockers wanting extreme metal distortion effects on their guitar. 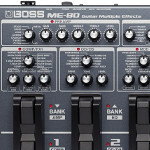 The ML2 is the heaviest distortion pedal made by Boss. AC-RE20 The Boss RE-20 Space Echo Twin Pedal is one of the most beloved echo effects ever made - now available in a new twin pedal version. AC-RT20 Boss RT-20 Rotary Twin Pedal. the RT-20 Rotary Sound Processor. Employing COSM-modelling technology, the RT-20 authentically reproduces classic rotary-speaker sounds. AC-ST2 From fat crunch to ultra high-gain distortion, the Boss ST-2 Power Stack delivers famous Boss distortion with a stunning amount of power that�s akin to coveted tube amps and professional amp stacks. AC-SYB5 The Boss SYB-5 was the worlds first bass synthesizer to be packed into a compact pedal. 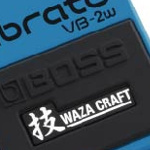 5 Years warranty on Boss effects pedals. AC-MT2 The Boss MT-2 Heavy Metal Zone guitar effects pedal offers huge tonal control through a 3 band EQ. Distortion/ overdrive control at its best. AC-AC3 AC-3 Acoustic Simulator Guitar Effect Pedals Acoustic Simulator compact enables you to model acoustic guitar sounds thr ough your electric guitar. Boss has pushed the boundaries of the pedal world for over 35 years with their first product being the CE-1 Chorus Ensemble pedal. 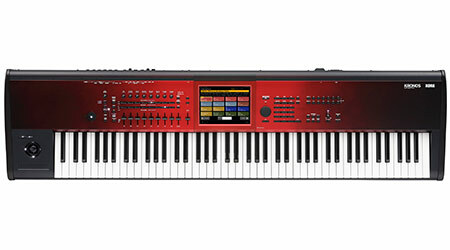 Boss now have innovative products such as multi effects, rhythm machines and audio recorders.